Thousands of parts available for vintage Ford tractors! Franklin Equipment has an extensive parts inventory and is located near several OEM parts depots to provide your parts as quickly as possible. We offer OEM and aftermarket parts. Check the online catalogs for the correct part number, and contact us with your order. We’ll find the parts you need and have them ready to be picked up or shipped the next day. If it’s not in stock, we’ll locate the parts through our extensive network of parts resources. 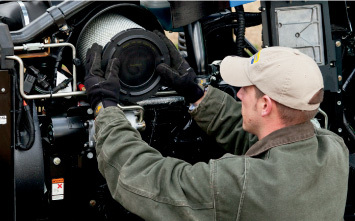 Our dedicated parts staff has an average of over 20 years experience servicing our customers.We’re familiar with almost any type of equipment—from vintage machines to the latest models with computerized controls. We can identify the right part, right away, to have you up and running as quickly as possible. We have a full selection of good used and rebuilt engines, hydraulic cylinders, finals, and wheel motors. Our remanufactured components are rebuilt to factory specifications and are priced at a fraction of the cost of new parts and components. They provide excellent value and come with a same-as-new warranty.